These unique 6-week courses range from introductory level to advanced level training, helping you explore the fundamentals of solar components, system architectures, and applications for PV systems to the inspection, commissioning, performance verification, and troubleshooting of PV systems. You'll work through interactive online activities, power points, readings, quizzes, exercises, and homework, all available 24 hours a day, 7 days a week throughout the full duration of the course. American Board of Certified Energy Practitioners (NABCEP) training hours through SEI. Fundamentals" qualifies you to sit for the NABCEP PV Associate Exam. With the need for highly trained PV electricians rapidly growing in California, WECA Curriculum Development Lead Mike Moyer believes "It's great that WECA is able to partner with SEI to offer another way for the WECA community to get solar training. Our apprenticeship program covers solar basics, our existing online self-paced courses "Solar Power for Electricians" and "Faultless Solar" take solar to the next level for Journeyman Electricians and Advanced Electrician Trainees, and now our partnership with SEI allows another level of training for these students, plus the opportunity for NABCEP certification." 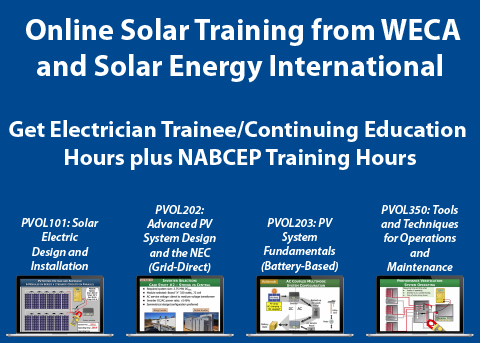 Trainee hours in addition to the NABCEP hours granted by SEI), please visit WECA's Solar Course Catalog. Act now to enroll in courses starting in February!